($9.95 + shipping) OUT NOW! 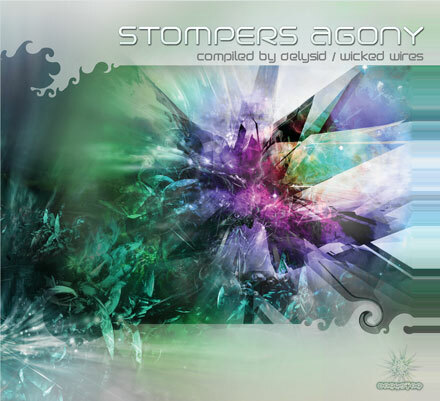 V/A "STOMPERS AGONY - Compiled by Delysid/WickedWires "
Delysid aka WickedWires has been raging around the world for the past year and ended up in the hot bed of South American Psytrance, Brazil! With tons of big parties under their belt playing as either of their super wild live acts or doing epic dj sets of featuring tons of unreleased tunes from close and far they finally slowed down enough to compile these 9 super stormers into a cohesive flow and the results are devastating! The bass can be heard for miles and the energy is just exploding causing you to dance so hard and uncontrollably that your body aches and your mind is reeling! Grab your stretcher or wheel chair and put it near by because you will need to be carried away from the dance floor (or your living room) when you are done! As if that was not enough Doctor Spook, renowned label manager for Geomagnetic Label Family has graciously contributed one special unreleased extra hit from rising star META coming from his NEW full length album next month..! Prepare yourself for an epic journey into STOMP as you writhe and twist your way into this vibrational ecstatic playground of the senses. Enjoy this DARK and ROWDY treat from the Labels that never cease to amaze with their sensational and timely deliveries: ACIDANCE and GEO-DARKSTAR. Right Click and choose "Save Target as" on the track names to Download 4 min mp3.